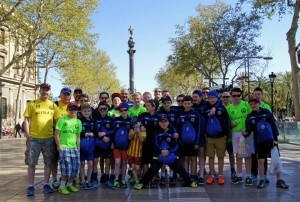 Moyola Park Under 13’s team are just home from their Development Tour to Salou/Barcelona courtesy of Darren at DB Sports Tours, and what a fantastic experience it was for both the players and coaches alike. It was August 2014 when we had our very first fundraising event to take these boys on a trip of a lifetime, and right up until the Saturday before travel, they were still fundraising. With the help, support and efforts both physically and financially from parents, coaches and local businesses (and some further afield) we made our target. With the help of Henry Brothers we were able to kit out the boys in tracksuits and also very generous businesses and individuals provided sponsorship for the quality t-shirts for each player, one for each of the five days in Spain. So now that we looked the part we needed to show what Moyola Park as a club and the under 13’s as a team could do. From Castledawson via Dublin to Salou it was a long day travelling, but even that couldn’t quash the excitement of the boys(and coaches too). When we arrived at our accommodation, the Cambrils Park Resort, we were over awed by the secure quality environment filled with loads of entertainment for all players and their individual needs. We had our first training session with one of the local Catalan coaches who put our boys through their paces ‘Barcelona style’. From a player’s point of view it was an amazing opportunity in an amazing facility at Futbol Salou. From the coaches point of view we too were entertained by the simplistic, yet so effective style of training sessions on show, with the main objective of the players decision making being key to success. Later that day was a match against a local team, Cambrils FC. This certainly was an eye opener as early in the day the boys participated in training the Catalan way and now they got to see it first hand against a wonderful team performance from Cambrils, not only technically but the boys themselves were very humble and happy to have played, which was very refreshing to see from a team at this age. This is how it should be done, was the lesson of the day. We did however score a goal from Tyler Cassidy, against our Spanish counterparts which did give us some hope. The next day was a great experience also as we got to play a professional team in Northampton Town FC, and again these young lads were technically excellent and gracious with it. We managed to score a goal against Northampton, from Dylan Wilson this time, which again proved that Moyola Park Under 13’s as a team have only one direction to go, and that is up. Later that day however we had a great experience coming our way, with a trip and match to take in at the Camp Nou in Barcelona. On the way we stopped at Espanyol’s stadium, which was excellent and then we got to the ultimate Club, Barcelona. A big majority of these boys had never been in a stadium before, let alone one of this magnitude. The excitement, joy and wide eyed expression were magical as these boys may never witness the likes of this again, with Lionel Messi, Luis Suarez and Xavi only some of the megastars on show. The score was 4-0 to Barcelona and just epitomised the tour for me as the boys came, they saw and they conquered with a Mexican wave started by Moyola Park FC that resonated around the whole stadium. Unbelievable was a word that was used quite a lot on our tour, which was finished off with another training session the following day. This training session however was full of vigour, effort, control and development compared with the first. The boys absolutely had a wonderful time from start to finish, from training the Spanish way to watching hero’s in their home stadium, to spending time with each other developing their skills, attitudes, outlook and friendships that without the trip may not have been. In closing I would like to thank all the parents, Coaches, Businesses, DB Sports tours and the boys themselves for making this dream a reality.